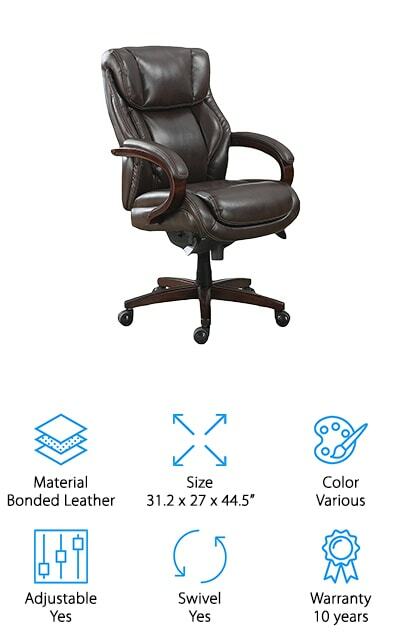 An executive office chair is much more than just an impressive seat for your desk. The truth is, the right chair helps keep your back and neck from getting sore after a long day at your desk. We researched the best-selling and top-rated products to put together this review. Whether you’re looking for the best leather office chair or one that supports your bad back, here are some of the main features you should know before you shop. 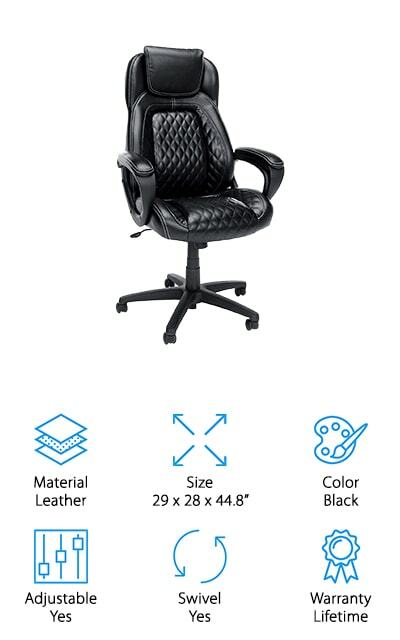 Material: If you want a heavy duty office chair, the material is important. There are a lot to choose from here, including textiles, bonded leather, PU leather, vinyl, mesh, and plastic. Chances are, you’ll find something that suits your needs. Size: Size is particularly important if you have a small office. Some of these chairs have a decent sized footprint and can take up more room than you realize! Don’t worry, we found a variety of sizes for you. Color: There are a few options that are only available in black but some come in a few colors. Obviously, color has nothing to do with the comfort of a back support office chair but it does matter for office decor. Adjustable: All of these chairs are adjustable as far as height but some are adjustable in other ways, too. A few allow you to adjust and lock the recline and tilt, too. This really lets you fine tune for comfort. Swivel: You’ll be happy to know that all of these chairs have a swivel feature. Not only is this insanely practical, but, let’s be honest, spinning around in your office chair is just a fun thing to do. Warranty: The warranties on these products vary quite a bit. Some of them are only covered for a year while others go up to ten or twelve years. We even found one that comes with a lifetime guarantee! Now that you know a little more about what to look for, let’s take a closer look at our top ten picks. Here’s how it works. We put out top and budget picks right at the top of the list. That way, if you’re in a hurry, you’ll still get some idea of the range that’s available. Stick around if you can, though, all of these products are unique and pretty great. Alright, are you ready? Let’s get started. Our top pick is the Herman Miller Embody Chair, an ergonomic executive chair that was specifically designed for people who work at a computer all day. It helps encourage the best possible posture and stimulates blood and oxygen flow to help you stay focused. There’s even a built-in working recline that reduces spine compression for increased comfort. The narrow back supports you while you twist and reach while working. Plus, you get the same support whether you’re in a reclined or upright position. The textile covering lets air flow to keep you cool while you work. 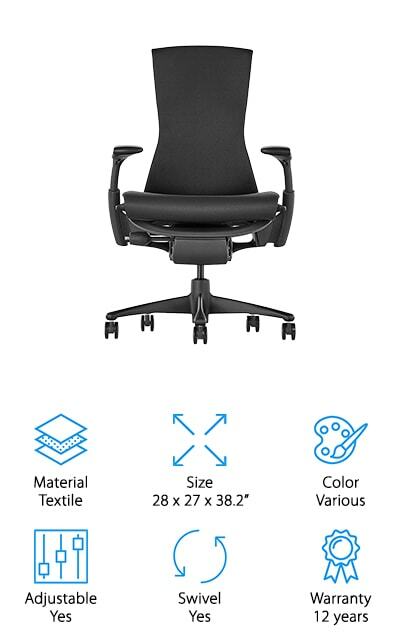 And speaking of textile, there are sixteen different colors to choose from so you can find the perfect chair to match your personality or your office. And get this: it comes with a 12-year warranty. 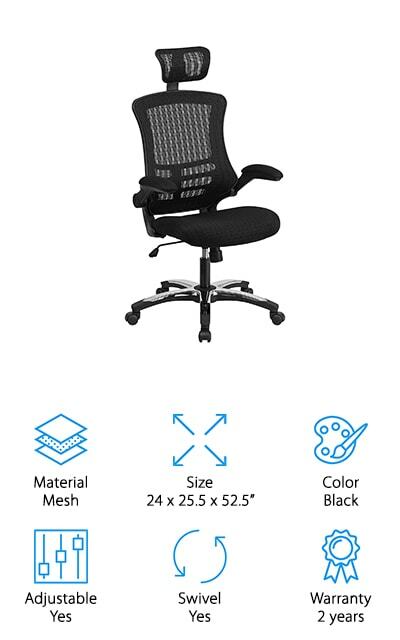 Our budget pick is next and it’s a great choice for conference room chairs. The La Z Boy Bellamy Executive Chair is was designed with comfort in mind. The core of the seat is made of memory foam plus you can adjust the height and tilt to your preference. Layered padding on the seat and headrest contribute to the zone-based support system, providing extra support and cushioning where you need it the most. They included a contoured lumbar area to provide additional lower back support, too. There are also durable, heavy-duty casters allow you to easily position yourself around the conference table. This chair is available in six different colors so it’s easy to find the right one for your office decor. One more thing, it comes with a 10-year warranty. 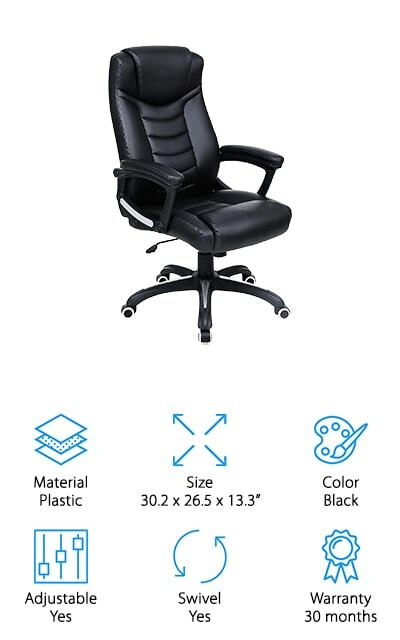 Another good choice for a comfortable office chair for the money is this one from BestOffice. This plush, modern design adds a bit of style to your office but is also really supportive. The seat cushions support your lower back. That’s not all, the backrest also has a lot of soft padding that helps prevent back and leg pain from sitting too long at your desk. Plus, it can even help improve your posture! This chair is upholstered in PU leather and is oil and water resistant. It’s also really easy to wipe clean when needed. Adjusting the height of the chair is really easy and you can position it any way you need to with the 360 degree swivel. This chair is roomy and suits just about anyone up to the 250 pound weight limit. The OFM Executive Chair is up next. This leather executive chair is smooth and soft with white stitching that gives it a definite race car seat look. 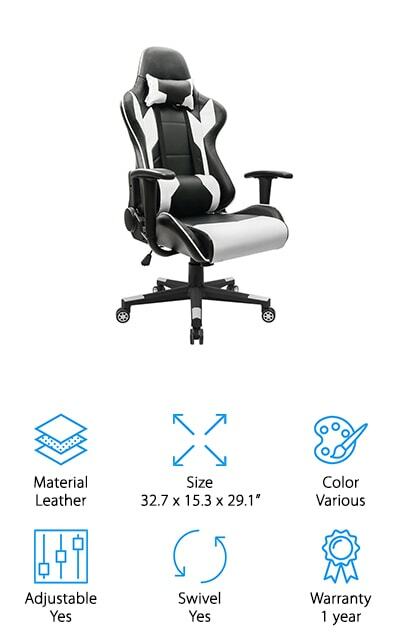 It offers a ton of support including segmented padding on the seat and back, an integrated padded headrest and fixed arms as well as significant upper body support. Not only is the height adjustable, you can also fine tune the tilt tension and swivel 360 degrees. OFM really puts their designs through a lot of testing to make sure they’ll last a long time. For example, the casters are rated to roll over 40 miles and the frame is tested with a 300 pound drop. And get this, they test the tilt 100,000 times. Because they know this chair can take a beating, it comes with a lifetime warranty. Next up in our list for best executive office chair comes from Songmics. It’s upholstered in PU fabric that’s really durable and easy to clean. Thick, high-density foam provides comfort while also giving the right kind of support to avoid the aches and pains that can be caused by working at a computer all day. The headrest is designed to perfectly fit the natural curves of your head, neck, and shoulders while the back of the chair perfectly supports your whole spine, including the lumbar region. They even designed the armrests to keep them relaxed while you work. The castors are great for any kind of hard flooring. They’re made of high quality plastic that causes less damage to the floor and doesn’t make a lot of noise. Plus, you get a thirty month warranty. For a modern office chair that’s as stylish as it is comfortable, take a look at this executive chair from Homall. This chair is available in four different styles, each with a modern design featuring large blocks of color or texture against a black background. High-density foam cushions provide comfort, support, and resilience. The support extends the full length of the back and includes the head, neck, and shoulders. One of the unique things about this chair is that it reclines all the way to 180 degrees. There’s also a 360 degree swivel and a rocking feature that you can adjust with a knob located below the seat. This chair is also really easy to move around in thanks to the smooth casters. It comes with a 1-year warranty and can hold up to 300 pounds. The Serta Airway Executive Office Chair is one of the best ergonomic office chairs around. Why do we say that? 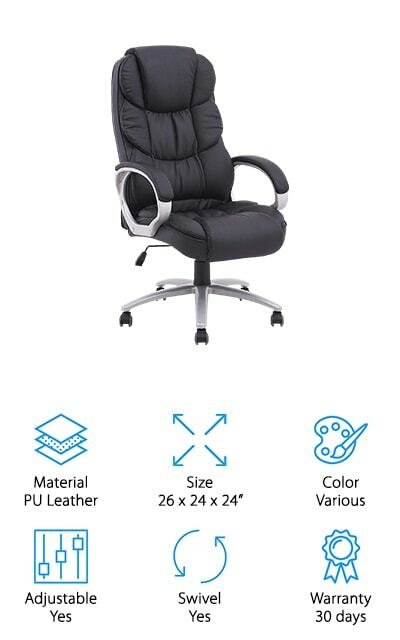 It features an air kinetic lumbar system that provides continuous lumbar support. How does it work? The large, supportive pad in the center of the chair fits the curves of your lower back. It’s designed to move from side to side so it follows your movements, offering you support even as you move around in the chair. That’s not all, there are also deep, ergonomic layered cushions that provide support with superior comfort. The armrests are sculpted for soft support. Even the control levers are positioned for easy reach and operation. Adjusting the height is easy plus it includes adjustable tension and a lock out feature. 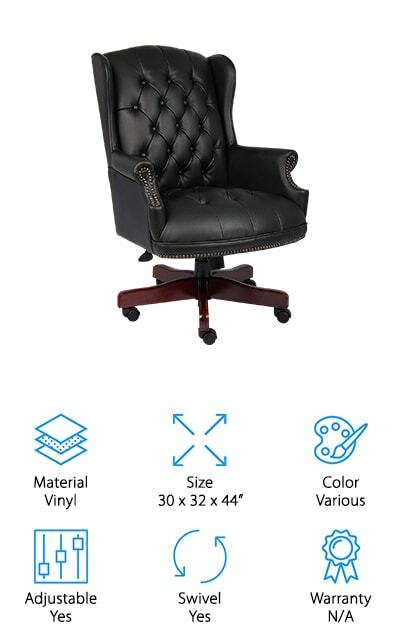 The Boss Office Products Traditional Chair looks a little more old fashioned than some other high end office chairs. The vinyl upholstery features a traditional button tufted design and the arms and bottom of the seat are adorned with hand applied brass nail heads. 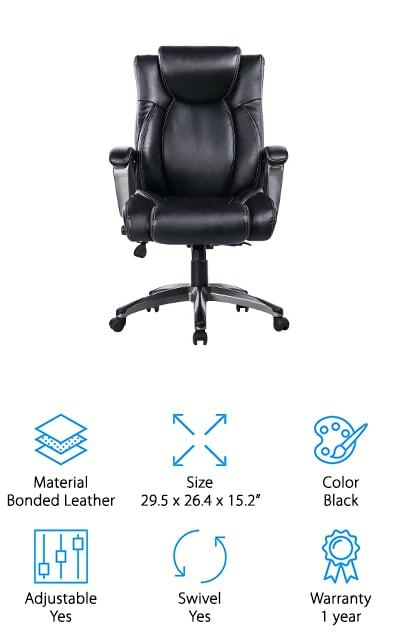 While this chair doesn’t have all the segmented cushions and specially designed lumbar pillows, it’s still extremely supportive and comfortable. That’s not all, the seat height adjusts easily so you can get into a comfortable position while you work. The seat is wide and roomy, too. You can recline it slightly and there’s even a handle that allows you to disable the tilt if you prefer. This chair is available in two styles. One is upholstered in matte, black vinyl. The other is shiny burgundy that features mahogany wood finish on the legs. The Flash Furniture Executive Chair is one of the more contemporary looking ergonomic office chairs we reviewed. The back is upholstered with mesh that allows air to circulate while also providing the appropriate support. This chair provides the right amount of support to relieve tension in the lower back. It even has an adjustable headrest that moves up and down to give support no matter how tall you are. This chair rocks, reclines, and rotates 360 degrees. That’s not all, there’s even a waterfall front seat that eliminates any pressure on your legs and helps to improve circulation. Height adjustment is simple, too. And get this, the armrests are designed to flip up and out of the way so you don’t have of go through the trouble of removing them if you prefer an armless chair. Last up is the Vanbow Office Chair, a reclining executive chair that has a plush memory foam layer that provides both comfort and support. There’s even a waterfall seat edge which provides a smooth, rounded edge that puts less pressure on the back of your legs which increases blood flow and reduces pain and fatigue. 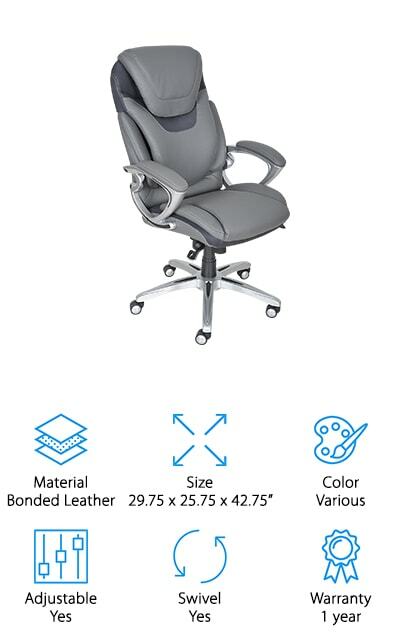 The unique thing about this chair is it has a built-in adjustable lumbar support. All you have to do is use the lumbar knob to increase or decrease the pressure as needed. You can also adjust the tilt tension and lock in the recline of your choice. The heavy-duty nylon base allows the chair to rotate a full 360 degrees and the casters provide excellent stability and easy movement across any hard floor.